on left on upper rim of self-base: BOUCHARDON 1744. Possibly Fermier-général Bouret, Paris, before 1757. Sir Richard Seymour-Conway, 4th marquess of Hertford [1800-1870], London and Paris, by 1865; by inheritance to his illegitimate son, Sir Richard Wallace [1818-1890], London and Paris; by inheritance to his wife, Julie-Amélie-Charlotte Castelnau, Lady Wallace [1819-1897], Paris and London; by inheritance to her adviser and secretary, Sir John Murray Scott [1847-1912], London and Paris; by inheritance to his friend, Victoria Sackville-West, Lady Sackville [1864-1936], Paris; sold 1913 to (Jacques Seligmann et Cie, Paris and New York); sold 1914 to Ivor Churchill Guest, 2nd Baron and 1st Viscount Wimborne [1873-1939], Canford Manor, Wimborne; (his sale, Christie, Manson & Woods, London, 6-8 March 1923, 2nd day, no. 256); Matthews. Mortimer L. Schiff [1877-1931], New York; (his estate sale, Christie, Manson & Woods, London, 22-23 June 1938, 1st day, no. 34); (Jacques Seligmann et Cie, Paris and New York); sold 11 May 1950 to the Samuel H. Kress Foundation, New York; gift 1952 to NGA. See entry by Charles Avery in Ulrich Middeldorf, Sculptures from the Samuel H. Kress Collection, London, 1976:102-104. Lord Hertford lent the sculpture to the Musée Retrospectif, held in Paris in 1865. See F.J.B. Watson, "Lord Hertford and the Musée Retrospectif of 1865," Apollo 81 (June 1965): 436, fig. 2. A copy of the 1923 sale catalogue in the library of the Getty Research Institute is annotated with the buyer's name "Matthews" (copy in NGA curatorial files). Musée Retrospectif, organized by the Union Centrale des Beaux-Arts Appliqués à l'Industrie, Palais de l'Industrie, Paris, 1865. Exposition de l'Art Français, Paris, 1883-1884. Exposition de l'Art Français sous Louis XIV et sous Louis XV, Maison Quantin, Paris, 1888, no. 68. French Paintings and Sculptures of the 18th Century, The Metropolitan Museum of Art, New York, 1935-1936, no. 64, repro. Madame de Pompadour et les arts, Musée national des Châteaux de Versailles et de Trianon; Kunsthalle der Hypo-Kulturstiftung, Munich; National Gallery, London, 2002-2003, no. 135 (French cat. ), no. 127 (German cat. ), shown only in Versailles and Munich. Paris: Life & Luxury in the Eighteenth Century, The J. Paul Getty Museum, Los Angeles; The Museum of Fine Arts, Houston, 2011-2012, no. 68, fig. 2, (see also catalogue pp. 3-4). Courajod, Louis. Livre-journal de Lazare Duvaux, marchand-bijoutier ordinaire du roy. 2 vols. Paris, 1873. Reprinted, Paris 1963:I: CCLXII. Roserot, Alphonse. Edmé Bouchardon. Paris, 1910: 86, pl. XVII. Wehle, Harry B. and Preston Remington. "French Painting and Sculpture of the XVIII Century." Bulletin of The Metropolitan Museum of Art 30 (1935): 206-215, repro. "The Art News of London." Art News 36 (16 July 1938): 18. Paintings and Sculpture from the Kress Collection Acquired by the Samuel H. Kress Foundation 1945-1951. Introduction by John Walker, text by William E. Suida. National Gallery of Art, Washington, 1951: 252, no. 113, repro. Paintings and Sculpture from the Samuel H. Kress Collection. National Gallery of Art, Washington, 1959: 443, repro. Seligman, Germain. Merchants of Art 1880-1960. New York, 1961: 100-101, 273, pl. 20. Cecil, R. A. "French Eighteenth Century Sculpture formerly in the Hertford-Wallace Collection." Apollo 81 (June 1965): 449-459, repro. 452. Summary Catalogue of European Paintings and Sculpture. National Gallery of Art, Washington, 1965: 147. Watson, Francis J.B. "Lord Hertford and the Musée Rétrospective of 1865." Apollo 81 (June 1965): 434-443, repro. 436. European Paintings and Sculpture, Illustrations. National Gallery of Art, Washington, 1968: 130, repro. 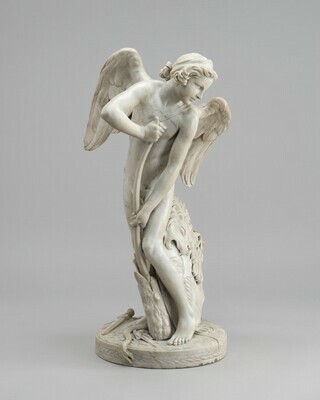 La statue équestre de Louis XV; dessins de Bouchardon, sculpteur du Roi, dans les collections du Musée du Louvre. Exh. cat., Musée du Louvre, Paris, 1973: 21, under entry no. 32, by Françoise Baron. Louis XV, Un Moment de Perfection de l'Art Français. Exh. cat. Hôtel de la Monnaie, Paris, 1974: 69-71. Middeldorf, Ulrich. Sculptures from the Samuel H. Kress Collection: European Schools XIV-XIX Century. London, 1976: 102 [entry by Charles Avery]. Seinkewicz, Thomas J. Classical Gods and Heroes in the National Gallery of Art. Washington, D.C., 1981: 38, repro., 39. Walker, John. National Gallery of Art, Washington. Rev. ed. New York, 1984: 643, no. 1013, repro. Sculpture: An Illustrated Catalogue. National Gallery of Art, Washington, 1994: 32, repro. Scott, Katie. "Under the sign of Venus: the making and meaning of Bouchardon's L'Amour in the age of the French rococo." In Arscott, Caroline and Katie Scott, eds. Manifestations of Venus. Art and Sexuality. Manchester and New York, 2000: 69-89, 193-201, esp. 194 n. 4. Bremer-David, Charissa, ed. Paris: Life and Luxury in the Eighteenth Century. Exh. cat. J. Paul Getty Museum, Los Angeles; Museum of Fine Arts, Houston, 2011: 3, fig. 2, no. 68.